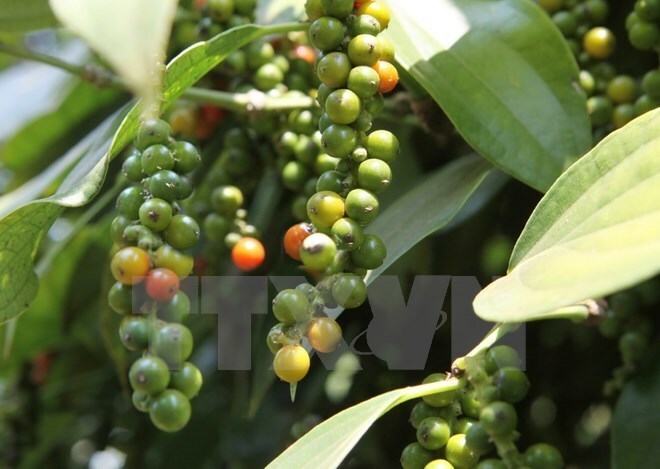 DakLak (VNA) – The price of black pepper in the Central Highlands provinces has continued to plummet, hitting 80,000 – 82,000 VND per kg, a low record in the last seven years. According to the Steering Committee for the Central Highlands, the price of black pepper once reached 230,000 VND per kg, bringing profits of 3-4 folds higher than those coffee and cashew nuts. Therefore, farmers in the Central Highlands expanded pepper growing areas despite authorities’ warnings, leading to excess supply and falling prices. According to plans, Dak Lak, Dak Nong, and Gia Lai provinces will have 6,000 ha of pepper growing areas each by 2020. However, the current pepper coverage in the provinces is 28,000 hectares, nearly 25,000 hectares and 15,697 hectares, respectively. Additionally, farmers grow pepper on poor land, or replace old coffee plants with pepper without treating disease-infected soil. They also use fertiliser and chemicals, and small pepper trees, running the risk of mass pepper plant deaths. The committee urged localities to review planning and management of pepper growing and production. According to the committee, localities should also provide technical assistance for local farmers in selecting suitable land, sibling trees, growing, caring, harvesting and drying. Focus should be put on developing regional or local pepper brand names while forming linkages among farmers, enterprises and scientists to ensure the sector’s sustainable development.